Who doesn’t like a warm welcome? Whether your customer is walking into your store or just signed up on your website to receive communications from you, she expects a warm reception. It’s important to make that first impression count. A welcome series helps the conversation open up between the customer and your brand. It sets expectations on the types and cadence of content the customer will receive. Welcome emails also garner 86 percent higher open rates than regular promotional mailings – not too shabby! 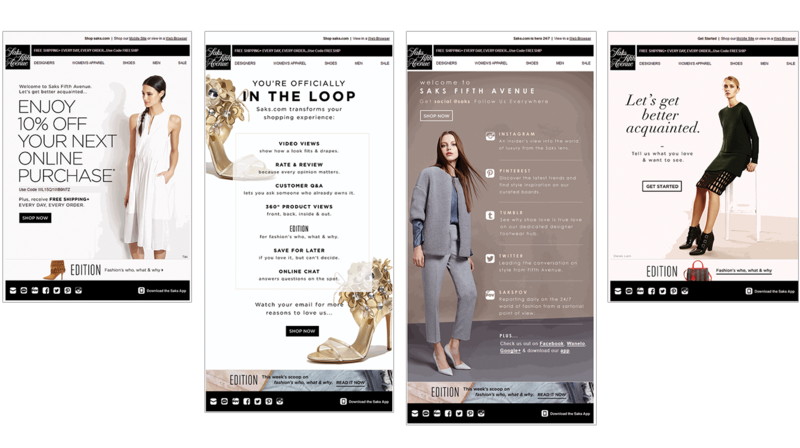 Saks’ results are consistent with Experian Marketing Services’ welcome email findings which indicate that emails triggered in real time receive up to 10 times the transaction rates and revenue per email vs. those that are batched. A welcome series has also been shown to increase retention by educating customers on new ways to use products and services they’ve purchased from your brand. These emails also can remind customers of the benefits they’ll reap from enrolling in your loyalty programs or credit card. Even if a customer has been welcomed and has interacted with your programs, a day may come when the customer goes silent. Reactivation campaigns are an effective way to get them to re-engage. Naturally, it’s important to target your dormant customers in a variety of channels so you can reach them more effectively. Maybe you’re wondering why I jumped from the warmth of a welcome series right into reality of needing a reactivation campaign. The reason? Marketers need to understand where a customer is in their lifecycle and come full circle with customers if they have parted ways. Marketers can pique the interest of a returning customer by telling them what’s new and reintroducing them to their brand. 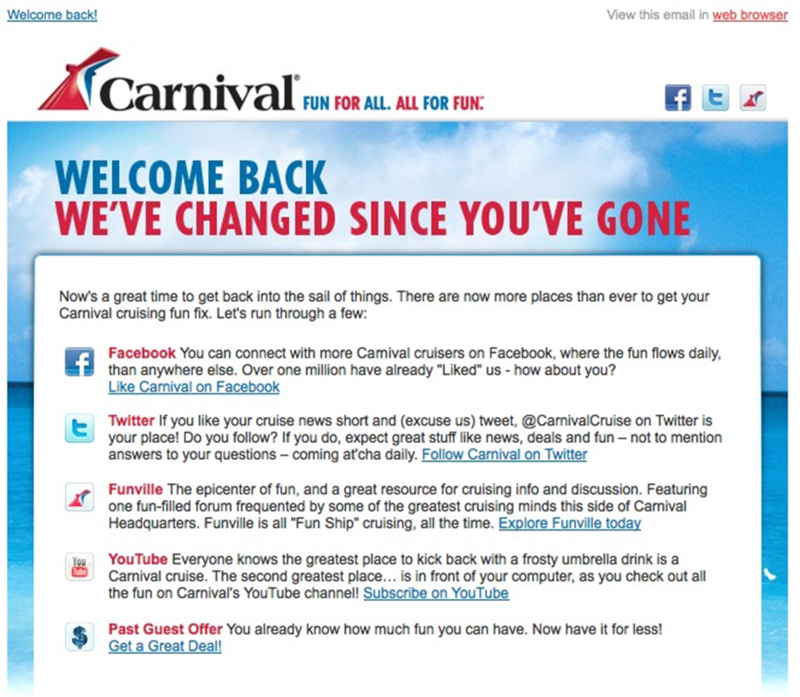 Carnival® Cruise Lines, for example, sends a welcome-back email that features the newest social networks, offers and deals its customers can take advantage of immediately. At the end of the day, customers expect to receive relevant and engaging messages throughout their entire relationship with a brand. Customer life cycle programs deliver just that. If you’re interested in learning more about welcome campaigns, waitlist/back-in-stock programs and other remarketing strategies, check out our webcast, Driving revenue through customer lifecycle marketing featuring Josh Pratt, Director of Email & Promotions for Saks Fifth Avenue and Saks Fifth Avenue OFF 5TH.